The Hollies provides excellent accommodation just a 5-10 minute drive to The National Exhibition Centre. This makes The Hollies one of the closest and largest bed and breakfasts around the area. Having 10 en-suite rooms and sleeping up to 21 people, makes us ideal for companies exhibiting at The NEC, as we can provide rooms for all their staff, which we are continually doing for many companies year after year. Customers have been coming to The Hollies for over 10 years and have noticed considerable changes making us better and better each visit. JUST AROUND THE CORNER IS WEST MIDLANDS GOLF CLUB. WITH A FABULOUS LAKE RESTAURANT OVER LOOKING THE GOLF COURSE. THE BULL at Meriden within walking distance of Apartments in Meriden, short drive from Holllies. THE GEORGE IN THE TREE BEEFEATER at the top of the road from Hollies, 2 minute drive, 15 minute walk. 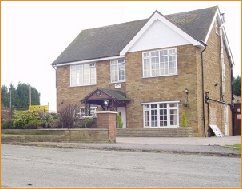 THE WHITE HORSE in Balsall Common, short walk from apartment, 4 minute drive from Hollies. THE BEAR at Berkswell 2 minute drive from Meriden, 5 minutes from Hollies and Balsall Common, Very pretty listed pub old and charming, excellent food. 2 Apartments in Meriden Village and 1 in Balsall Common Village. Superb 2 bed roomed apartments located in a beautiful village called Meriden. Situated opposite a duck pond Ideally located for the number 900 bus which stops outside and goes to the NEC/Airport, Birmingham City and Coventry. 2 bedrooms, lounge, modern new kitchens & appliances, bathrooms with bath/showers and private garages.